Today was Day #5 of Chocolate and Bacon Theme Week. 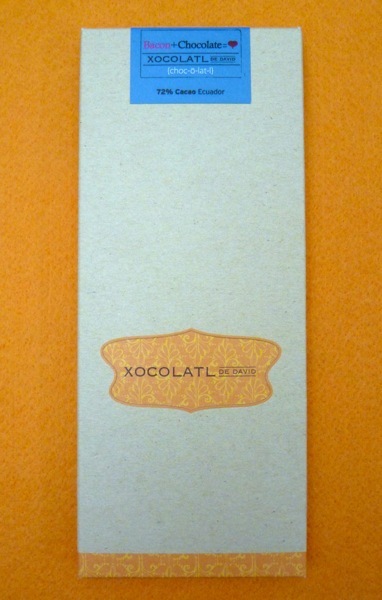 Xocolatl de David (Portland, Oregon) makes several interesting bars -- among them, this Bacon + Chocolate bar, made with 72% Cacao from Ecuador. You could see identifiable pieces of bacon, with a recognizable bacon bite -- not too fatty, not too dry and chewy. Close to just right. The chocolate was quite good, with a very faint nutty taste. (Although my preference with bacon would be a deep milk with just a hint of salt.) Often cacao with "nutty" flavor comes from Ecuador and Peru.